As part of one of our talks today we focused on a wonderful movie, We Bought a Zoo. It was about a man and two kids who searched for something to replace their grief from the loss of a wife and mother. They looked for something to unite them, excite them, to set them free from the heartache and sorrow. Amazingly, all of our Marianist high school students attending the Life Teen Conference were moved by this film clip. We all have had moments when we decided we couldn’t—we wouldn’t—do something. But there was one of our students who spoke about the experience to do something with his life. In particular, the student spoke about taking a mountain of boldness to do something of monumental proportions. The courage and the conviction to do something can overwhelm us at times. I’m sure there will be many more hurdles in this student's life. Twenty seconds of courage. Something great will happen. Maybe not on our terms. Maybe not even at the right time. Sometimes God calls us to do something great for him. What about you? Have you given yourself twenty seconds of courage, repeatedly? I double-dog dare you to unleash your inner self. Something great will happen. The Marianist high school students attending the Life Teen Conference at Benedictine College were filled with challenging thoughts today. They were taught how to defend their faith, how to develop their prayer life, and what the Church teaches on many hot contemporary topics. The evening continued with a vocational talk from the Dominican Sisters of Mary, Mother of the Eucharist. "The consecrated life thus becomes one of the tangible seals which the Trinity impresses upon history, so that people can sense with longing the attraction of divine beauty." Today nine students from our Marianist high schools traveled to Atchison, Kansas to attend the LifeTeen Leadership Conference. Over 500 high school juniors will attend the conference this week. We learned something new today when we arrived at Benedictine College. Everywhere the medal of St. Benedict is depicted and explained. For the early Christians, the cross was a favorite symbol and badge of their faith in Christ. From the writings of St. Gregory the Great, we know that St. Benedict had a deep faith in the Cross and worked miracles with the sign of the cross. This faith in, and special devotion to, the Cross was passed on to succeeding generations of Benedictines. who prepared the way before your Son. You set him apart from others, marking him out with special favor. even in the womb he leapt for joy, so near was our salvation. to show the world its redeemer, the lamb of sacrifice. in waters made holy by the one who was baptized. his last and greatest act of witness to your Son. So what is the Year of Faith? One of my students asked the unexpected question: Isn't every year a year of faith in the eyes of the Catholic Church? 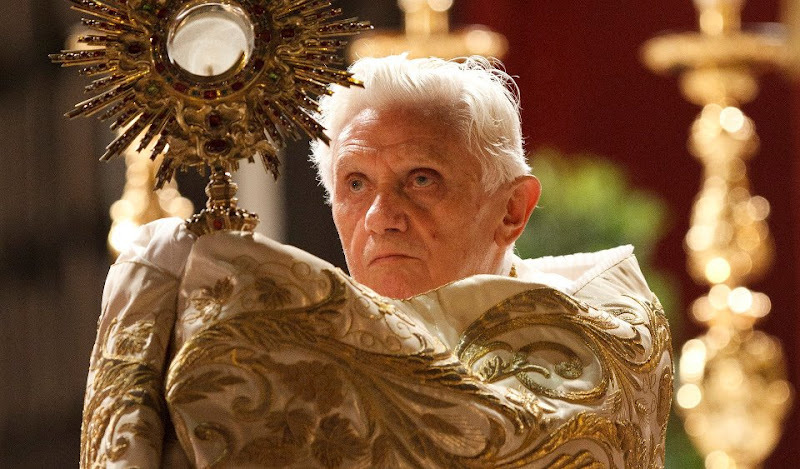 Perhaps it's better to use Pope Benedict's words from his recent Motu Proprio Porta Fidei - a personal statement that announced the Year of Faith. He said we should look at faith as a "lifelong companion that makes it possible to perceive, ever anew, the marvels that God works for us. Intent on gathering the signs of the times in the present of history, faith commits every one of us to become a living sign of the presence of the Risen Lord in the world." So why now? It's no coincidence that the Year of Faith starts on October 11 - the fiftieth anniversary of the Second Vatican Council. The word renewal comes to mind. In a sense, the Holy Father is inviting Catholics to take their faith and encounter with Christ to another level - to deepen and develop it. Baptism and Confirmation set us on the path but it's a long journey with downs as well as ups, doubts and challenges as well as revelation and joy. One thing's certain - Christ is the lifelong companion Pope Benedict refers to and this is a 12-month opportunity to get closer to Him. Three months after the announcement and a full nine months before the Year of Faith itself, what is the Church doing to encourage the faithful and help us prepare? In Rome, on January 6th, Cardinal William Levada, President of the Vatican Congregation for the Doctrine of the Faith released a number of pastoral recommendations for the Year of Faith. Cardinal Levada also notes that World Youth Day, in Rio de Janeiro, falls during the year - July 2013 - and will offer the opportunity for young Catholic pilgrims "to experience the joy which comes from faith in the Lord Jesus and communion with the Holy Father, in the greater family of the Church." 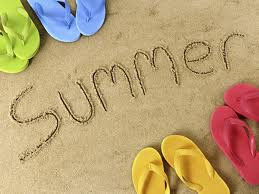 Summer vacation is the biggest break of them all. That’s partly because of the lore that’s been built up around it over time. Ever since school started being a thing, kids couldn’t wait for those three months a year when it’s not. It’s a time of year to do all that stuff that feels better knowing you don’t have to wake up for class the next day, which is to say all stuff. It was also a constant — something kids everywhere (from kinder to college) use to inject themselves with motivation during the school year. Motivation which, unfortunately for teachers everywhere (from kinder to college), completely runs out a full month before the last day of school. I never had the adventure-filled, picturesque summer breaks that Tom Sawyer and Huck Finn had, nor did I break into hotel swimming pools or hang out at truck stops just to pass the time, as The Ataris did. But it was always a time of respite for me, where I could fully enjoy a responsibility-less state. That’s a hard platform to stand on when your parents are suggesting you get a job, but I stood strong. I loved the freedom of summer break, when sleeping in or sitting around wasn’t something to be guilty about, and doing something fun wasn’t tainted by the knowledge that time is limited. Appreciation for summer evolves with age. Like many, I was a stupid kid, so I didn’t fully realize what I had until my mom was taking me to shop for new uniforms, by far the worst trip of the entire year. In high school, with The Ataris’ help, I realized that summers were sacred. Then college came, and summers started filling up — with trips, jobs and tasks. Those were great, but it was often hard to find time for respite among the busyness, which would only get crazier when the semester began. And now here I am, writing an article, as my editor so eloquently/knife-in-the-heart-ingly put it, “mourning summer vacation.” I’ve started to feel it, too — the weather’s getting prettier, graduation season is nearing its end, and my beach body has been ready for months, but still, I’m expected to go in to work. (Every day!) Still, the rent must be paid. Still, the music on the radio transitions to the inevitable summer jams, with their light, airy and unmistakably happy feel, because how can you not be happy when it’s summer? Except I’m listening to those songs in my car, on the way to work. And God smirks. The only thing that matters / is following your heart / and eventually you’ll finally get it right. So laugh it up, high schoolers. You may get three months off, but I’m going to take advantage of this weekend in ways you can’t even fathom. But first I’m sleeping in. 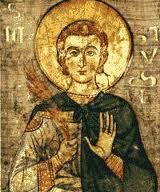 So who is this saint we celebrate today? 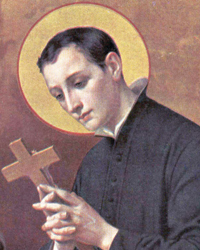 Who was St. Aloysius Gonzaga? He is an Italian Jesuit saint of the 16th century. Aloysius is the Latin form of Gonzaga's given name, Luigi. In English, the equivalent form would be Louis. The Gonzaga name is well known in Italy. 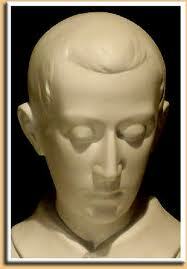 Aloysius Gonzaga was born near Mantua, Italy, in 1568 to a celebrated family of wealth and prestige. As the first born son of his father, Ferrante, his mother, Marta, he was in line to inherit his father's title of Marquis. He grew up amid the violence and brutality of the Renaissance Italy and witnessed the murder of two of his brothers. In 1576, Aloysius' parents sent him to attend the court of the Grand Duke of Tuscany, Francesco de'Medici, in Florence. Later, accompanied by his parents, he traveled to Spain to join the court of Philip II in Madrid. In Spain, Aloysius decided he wanted to join the newly founded religious order, The Society of Jesus. His father resisted his decision and there followed a struggle of wills that continued after his return to Castiglione in 1584. But Aloysius eventually prevailed. Renouncing his right to the title to the vast wealth he was destined to inherit, he entered the Society of Jesus in Rome. During his early studies in Rome, he would regularly go out into the streets of the city to care for victims of the plague. He himself contracted the disease as a result of his efforts for the suffering and died on June 21, 1591, at the age of twenty-three, six years short of his ordination as a Jesuit priest. Even before his time as a Jesuit, Aloysius was known for his love of prayer and fasting. He received his First Communion from St. Charles Borromeo. As a Jesuit at the Roman College, he continued to devote his time to prayer and practices of austerity. In short, the great spiritual masters from every tradition knew the value of humor and laughter. Let me give you just three quick reasons why. First, humor is a tool for humility. We can tell jokes about ourselves to deflate our egos, which is a good thing for everyone. Look, you're about to graduate from a Jesuit school, one the best in the country! It's easy to get a stuck up. It's just as easy in religious circles. prominence, and may be tempted to think you're better than everyone else: Don't. We are all limited, finite, imperfect human beings, from the guy who cleans up the dorms on Sunday mornings to president of the university. We're all beloved children of God; none of us better than the others. Laughing at ourselves helps to remember that. A second reason for humor is this: Humor speaks truth to power. A witty remark is a time-honored way to challenge the pompous and the powerful. Jesus deployed humor in this way, challenging some of the authorities of his time. Humor is a weapon against the arrogance and pride that infects all human beings, and infects religious institutions, because they are made up of human beings. The mother of a friend of mine, for example, was once in the hospital at the same time a local bishop, who was recovering from some minor surgery. The bishop took it on himself to go from room to room and visit all the patients. He came into my friend's mother's room and said to her, "Well, dear I know just how you feel?" And she said, "Really? When was your hysterectomy?" Later they became friends and, years later, he presided at her funeral Mass, where he told that joke on himself. He learned not to take himself with deadly seriousness. Finally, joy is an important part of our relationship with God. One of the best ways of thinking about our relationship to God is as a friendship. And any healthy friendship is leavened with some joy, some humor and a lot of laughter. The same goes for our relationship with God. Ever thought about incorporating joy into your spiritual life? After all, the Book of Isaiah, says, "The Lord takes delight in his people." So can you imagine God delighting in you? If that doesn't work, how about this: How many times have you heard "God loves you"? You think, "Yeah, whatever. That's just what God does." It's like wallpaper. But how about this: God likes you. That has a different energy to it, doesn't it? Can you imagine God liking you? humor and laugh-for God's sakes. To that end, I'll close with, what else, a joke? Why? Well, the better question is Why not? So a Jesuit priest and Dominican priest are en route to a theology conference at SLU and they get into this long discussion about whose job is harder, and they swerve off the road and hit a telephone pole and go straight to heaven. So they find themselves standing there in front of the gates of heaven. So the Jesuit and the Dominican priest wait outside for some time, until finally the golden gates open up. Just then a huge choir of angels starts singing and a long red carpet rolls out, all the way up to the foot of the...priest. And the rabbi stands back. you for being such a good Catholic." Finally, a long white carpet rolls out and Jesus Christ himself comes out. Jesus comes up to the priest, hugs him and says, "Welcome to heaven! Thanks for being a good Christian!" Then the whole group hugs the priest and claps him on the back. They all go back into heaven, laughing and singing St. Louis Jesuits songs, which is what they sing in heaven. The gates close and Dominican is left standing there, just agog. So now the Dominican is wondering who's going to welcome him. Maybe St. Dominic. Maybe St. Thomas Aquinas. After a half-hour passes, she starts to get antsy. An hour passes. Two hours pass and he starts to get annoyed. 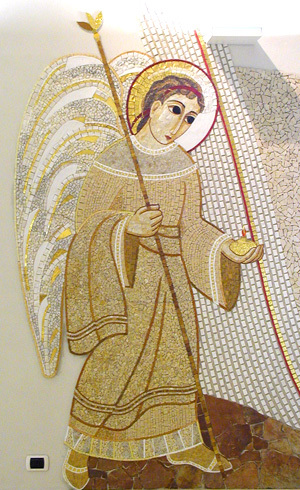 Finally, a little side door opens and a little Dominican saint, who he doesn't even recognize, calls out, "Hey you!" The Dominican looks around for the carpets, or St. Dominic, or St. Thomas Aquinas, or Jesus or Mary, and he walks up to the little saint. The saint says, "Oh yeah, so welcome to heaven." And the Dominican says, "Is that it?" And the little saint says, "What do you mean?" And the Dominican says, "Oh come on! Is that the welcome I get? After working so hard on earth? I mean, the Jesuit priest gets the carpets and the angels and the saints and Mary and Jesus, and all I get is this?" And the little saint says, "Oh yeah, yeah, yeah. Well, you have to remember something. We get Dominicans up here every day. We haven't had a Jesuit priest in years." Thank you very much. And: Go Billikens! Schools in the Marianist tradition strive to practice the virtues of Jesus and Mary so that they might educate as would Jesus and Mary. In the words of Blessed William Joseph Chaminade, "We teach in order to educate." Educate for adaptation and change. In today’s Gospel, Jesus told two parables about what the kingdom of God is like. The two parables used seeds to illustrate the growth of the kingdom of God. We may be able to understand that the seeds sown in the ground will begin to germinate and grow to produce a harvest, or grow into a tree that gives shade and shelter. Yes, we may be able to understand that. Yet, we may not fully comprehend the mystery of growth and change. It is not just about growth and change in seeds. It is also about growth and change in the kingdom of God. Since the day we were born, the seeds of the kingdom of God were sown in us. These are the seeds of love that help us grow into the image and likeness of God in whom we are created. But along with these seeds of love are also weeds of sin that are sown by the evil one. These weeds will try to choke the seeds of love, so that there is not only no growth, but also to cause the seeds of love to wither and die. So every choice and every decision we make will determine whether we grow or we choke. And every choice and every decision is one small step towards developing a habit that is either growing or choking. We can’t deny that one strong influence in our lives, besides our mothers, is our fathers. Yes, our fathers are indeed a strong influence and they sow tough seeds in us. And today, we also celebrate Father’s Day, so let me share with you two stories. World War II produced many heroes. One such man was Lieutenant Commander Butch O'Hare. He was a fighter pilot assigned to the aircraft carrier Lexington in the South Pacific. One day his entire squadron was sent on a mission. After he was airborne, he looked at his fuel gauge and realized that someone had forgotten to top up his fuel tank. He would not have enough fuel to complete his mission and get back to his ship. His flight leader told him to return to the carrier. Reluctantly, he dropped out of formation and headed back to the fleet. As he was returning to the mother ship he saw something that turned his blood cold: a squadron of Japanese bombers and fighters was speeding its way toward the American fleet. All the American fighters were gone on mission, and the fleet was totally defenseless. He couldn't reach his squadron and bring them back in time to save the fleet. Nor could he warn the fleet of the approaching danger. There was only one thing to do. He must somehow divert them from the fleet. Laying aside all thoughts of personal safety, he dived into the formation of the Japanese planes. So he charged in with guns blazing, attacking the surprised enemy planes. Butch weaved in and out of the now broken formation and fired at as many planes as possible until all his ammunition was finally spent. In desperation he even dived at the enemy planes, trying to clip a wing or tail in hopes of damaging as many enemy planes as possible and rendering them unfit to fly. This took place on February 20, 1942, and for that action Butch became the first Naval Aviator to win the Congressional Medal of Honor. And today, the O'Hare Airport in Chicago is named in tribute to the courage of this great man. The next story happened many years ago when Al Capone virtually owned Chicago. Capone wasn't famous for anything heroic. He was notorious for corrupting the city in everything from drug-trafficking and prostitution to murder. To show his appreciation, Capone paid him very well. Not only was the money big, but also, Eddie got special dividends. For instance, he and his family occupied a large fenced-in mansion with live-in servants and all of the luxuries. Eddie did have one soft spot, however. 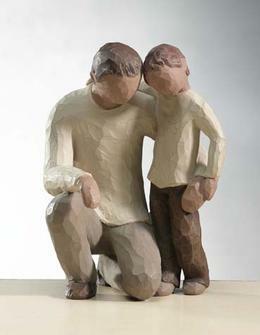 He had a son whom he loved dearly. Eddie saw to it that his young son had everything, and also a good education. And, despite his involvement with organized crime, Eddie even tried to teach him right from wrong. Eddie wanted his son to be a better man than he was. Yet, with all his wealth and influence, there were two things he couldn't give his son; he couldn't pass on a good name, or a good example. One day, Easy Eddie reached a difficult decision. Easy Eddie wanted to rectify wrongs he had done. The seed of God’s love was beginning to germinate in him. He decided he would go to the authorities and tell the truth about Al Capone, clean up his tarnished name, and show his son the meaning of integrity. But to do this, he would have to testify against The Mob, and he knew that the cost would be great. He would lose everything. So, he testified. Within the year, Easy Eddie's life ended in a blaze of gunfire on a lonely Chicago Street. But for him, he had given his son the greatest gift he had to offer, at the greatest price he could ever pay. Well, Butch O'Hare, the heroic fighter pilot was "Easy Eddie's" son. Indeed, a moving father-and-son story. Yet it is also a story of how a father felt the seed of God’s love growing in him. He had to kick an evil habit and change to grow in goodness so that he in turn can sow seeds of goodness in his son. And the seeds of goodness grew in his son and that gave him the courage to put his life on the line for others. Yes, we will reap what we sow. Not just in others but also in ourselves. God has already planted the seeds of love in us. We need to water it with prayer and let the seeds grow in us and bear fruit. May we in turn sow seeds of love in others so that they too will bear fruits of love for the Kingdom of God. The heart is one of the most important parts of the human body. It is the source from which and through which our life's blood flows through our veins, and is distributed to the various parts of our bodies. It is the first organ to function when we begin our existence as human beings, and the last to cease to operate when death comes. Many deaths are attributed to failure of the heart, and this might well be given as the cause of all deaths. Of all the organs of the human body the heart seems to be the most vital. With it life begins and ends. It is the beginning and the end, the alpha and the omega, of our physical existence. When the heart fails, death follows. The importance of the heart, however, does not consist so much in its physical qualities and operations as in that it is the seat of the affections. This is due chiefly to the close union that exists between the soul and the body. Through this union the heart responds promptly to the affections of the soul; it expands with joy, contracts with grief, melts as it were with compassion, quickens its pace with hope, and little by little succumbs to sorrow and sadness which finally devour it. 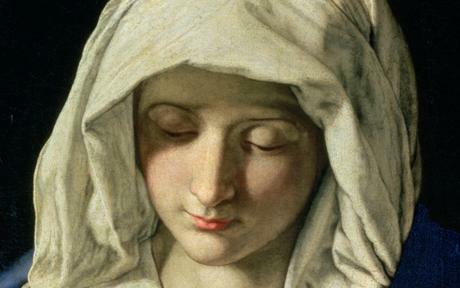 O Mary, Virgin most powerful and Mother of mercy, Queen of Heaven and Refuge of sinners; we consecrate ourselves to thy Immaculate Heart. We consecrate to thee our very being and our whole life: all that we have, all that we love, all that we are. To thee we give our bodies, our hearts, and our souls; to thee we give our homes, our families, and our country. We desire that all that is in us and around us may belong to thee, and may share in the benefits of thy motherly blessing. And that this act of consecration may be truly fruitful and lasting, we renew this day at thy feet the promises of our Baptism and our First Holy Communion. We pledge ourselves to profess courageously and at all times the truths of our holy Faith, and to live as befits Catholics, who are submissive to all directions of the Pope and the Bishops in communion with him. We pledge ourselves to keep the commandments of God and of His Church, in particular to keep holy the Lord’s Day. We pledge ourselves to make the consoling practices of the Christian religion, and above all, Holy Communion, an important part of our lives, in so far as we are able to do. Finally, we promise thee, O glorious Mother of God and loving Mother of men, to devote ourselves wholeheartedly to the spreading of devotion to thy Immaculate Heart, in order to hasten and assure, through thy queenly rule, the coming of the Kingdom of the Sacred Heart of thine adorable Son Jesus Christ, in our own country, and in all the world; as in Heaven, so on earth. Amen. CNS reports that the Vatican is in line to control the new Internet address extension ".catholic" and decide who is allowed to use it. The corporation is overseeing a huge expansion in the number of Internet extensions beyond the standard .com, .org., .edu and .gov. The extensions formally are known as generic top-level domains. The assignment of country-code top-level domains, like the Vatican's own .va, will not be affected by the change. Msgr. Tighe said that the Vatican's application to control the top-level domain .catholic "is a recognition of how important the digital space is for the church." Controlling the top-level domain "will be a way to authenticate the Catholic presence online," Msgr. Tighe said. The Vatican plans to allow "institutions and communities that have canonical recognition" to use the extension, "so people online -- Catholics and non-Catholics -- will know a site is authentically Catholic." The Vatican does not plan to allow individual bloggers or private Catholics to use ".catholic," Msgr. Tighe said. Use of the domain would be limited to those with a formal canonical recognition: dioceses, parishes and other territorial church jurisdictions; religious orders and other canonically recognized communities; and Catholic institutions such as universities, schools and hospitals. Controlling the domain name will promote "a more cohesive and organized presence" of the church online, "so the recognized structure of the church can be mirrored in the digital space." When the corporation discussed the idea of expanding the number of generic top-level domains in 2009, the Vatican representative to the corporation's governmental advisory committee, Msgr. Carlo Maria Polvani, expressed concern about "the possible perils" connected with religious domain names, including the risk of "competing claims" and "bitter disputes" between individuals or institutions claiming to represent, for example, Catholics or Muslims or Buddhists. Garcia was carrying a 12-foot cross along Interstate-30 in Fort Worth and Arlington on Thursday afternoon. He was hard to miss. “This is my way of showing them Jesus Christ wants a personal relationship with every single one of them,” Garcia said. The idea came to him last July, when he was attending youth group at the Oasis Church in Saginaw. He said that he realized his Christian walk wasn’t what it should be. “Oh, man, I was going through so much in my life and really searching to see what God had for me, His call on my life,” Garcia said. “I just felt that separation from Him and felt like it was just time to get rid of worldly desires and focus on Him,” Garcia added. Garcia remembers the day that it all happened for him. “July 24, 2011. I remember looking up to heaven saying, ‘I’m yours,’” he said. “That day, I decided to take up my cross. And I felt so strong in my heart. And I felt Him tell me where to go and how to go. And that’s where we’re going — Washington, D.C.” Garcia will have to walk 1,369 miles to get there. With breaks, he hopes to arrive in front of the White House for prayer on July 13.
the beauty of each and every one created in your image. and the breath of the Spirit be the joy of our lives. The life and mission of our community find their source and summit in the liturgy. Made a priestly people through Baptism, we celebrate the mysteries of Christ in the course of the liturgical year. to bring the human race to holiness. is central in our daily life. we form a single body. becomes a spiritual sacrifice, pleasing to God. we join the Church in its unending rhythm of praise and supplication. 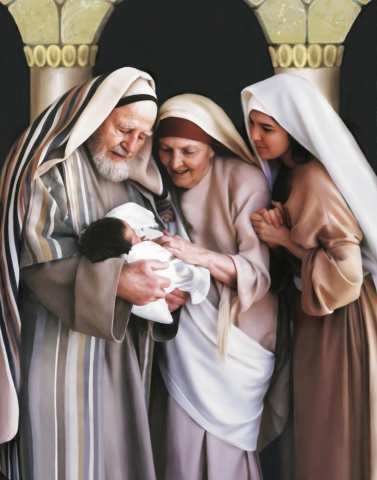 we enter into the longing and searchingof God's people throughout all ages. What you see is the bread and the chalice; that is what your own eyes report to you. But what your faith obliges you to accept is that the bread is the Body of Christ and the chalice the Blood of Christ. ... How is the bread His Body? And the chalice, or what is in the chalice, how is it His Blood? Those elements, brothers and sisters, are called sacraments, because in them one thing is seen, but another is understood. What is seen is the corporeal species, but what is understood is the spiritual fruit. ... `You, however,are the Body of Christ and his members.' If, therefore, you are the Body of Christ and his members, your mystery is presentedat the table of the Lord, you receive your mystery. 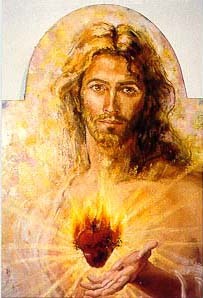 To that which you are, you answer: `Amen...' For you hear: `The Body of Christ!' and you answer: `Amen!' Be a member of Christ's Body, so that your `Amen' may be the truth. I am so happy that my name is on the list. He “offered himself without blemish to God,” says Sunday's selection from the letter to the Hebrews, in a sacrifice designed to “purify our conscience from dead works to worship the living God!" Jesus’ death on the cross gives us a place on the list. It offers us an opportunity to join the roll call of the redeemed, the sanctuary of the saints — all the saints, those who are forgiven, purified, renewed and restored. When you’re on this list, you can never be lost. We all know that the thing about lists is that they are just about impossible to get onto. Consider the list of the 40 richest people: In order to knock off anyone from their perch at number one, you’d have to come up with about 17 billion dollars. Not an easy task. Such a list is tough to crack, and so are the high-octane rosters of Most Powerful, All-Stars and Most Admired. The list we are on is not like those lists. The list we are on is for everyone. “For God so loved the world that he gave his only Son,” says Jesus to Nicodemus, “so that everyone who believes in him may not perish but may have eternal life." This gift is for everyone who believes — not just the elite. The list lasts forever. 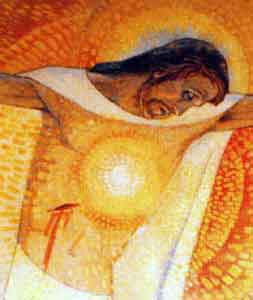 Christ “entered once for all into the Holy Place,” says the letter to the Hebrews, “not with the blood of goats and calves, but with his own blood, thus obtaining eternal redemption." Jesus gave his life, and the result is eternal redemption — his list is never going to change or diminish or disappear. Jesus has suffered once, for all, so that we might make his “list of life.” And we can respond, as so many have before us, with faith and with gratitude, with wonder and with worship. With our names on this list, we’ll never be lost. Every decade American society develops new language trends. Old words that have never been used much, suddenly become the new buzz word, or their meaning becomes something different. New sayings, expressions, and idioms are created and suddenly everyone is saying them AD NAUSEUM. Some mean different things to different people. A new one popped into our culture recently with a very distinct meaning. Take a look and enjoy. Top ten lists are a lot like fast food in many respects - they're cheap, the taste is overrated and they do nothing for your waistline, but we quite happily munch through them anyway. There's no real thought required to read a top ten list - if you're that disinterested, you can even ignore the body text and just read the headings - you'll still pick up the gist of it. It is this ease-of-digestion that allows people to quickly browse and gratify their surfing needs - the top ten list serves as an extremely efficient way to absorb information. 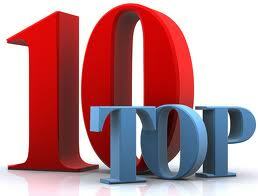 So we offer today the top ten list of the Vatican. Enjoy! 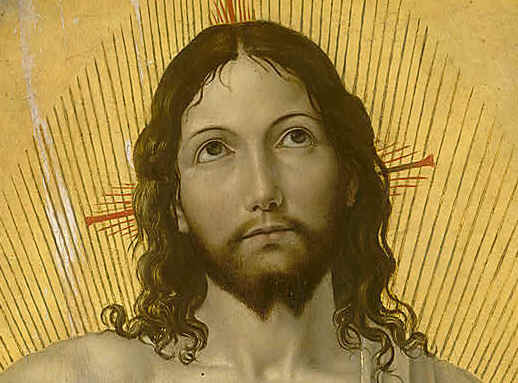 This well known icon simply shows us how the Trinity is a communion of persons. Rublev does not try to solve the mystery, rather his image draws us more deeply into the mystery of who God is.